Richard O’Brien’s THE ROCKY HORROR SHOW Returns for the Seventh Year! Dig out your fishnet stockings and sharpen your stilettos! That sweet transvestite and his motley crew are back for the seventh year in an annual tradition on the corner of Franklin and First in Historic Downtown Clarksville. Richard O’Brien’s cult classic THE ROCKY HORROR SHOW returns to the Roxy Regional Theatre for a limited engagement, October 19 – October 27. Hot on the heels of standout performances in HAIRSPRAY, Sean P. Kincaid and Jessica Caracciolo star as Brad Majors and his fiancee Janet Weiss, two clean-cut young people on the way to visit an old college professor. When they run into trouble and seek help at the freaky Frankenstein mansion, little do they know that Dr. Frank N. Furter — played by a stiletto and fishnet stocking-clad Drew Stairs — is in the midst of one of his maniacal experiments! THE ROCKY HORROR SHOW is presented by special arrangement with Samuel French, Inc., and is produced in part through the generous support of Gavin Berlyak and Tim & Kris Lee. Additional funding support has been provided by Brad & Lisa Martin. This production is recommended for mature audiences only. 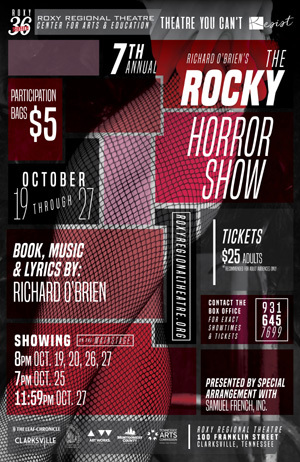 Audience participation is encouraged, and patrons are invited to dress up in their favorite ROCKY HORROR attire. Bags of props will be available for $5 in the lobby one hour prior to performances. Outside props will not be permitted, as they may damage the theatre or injure actors and/or audience members. THE ROCKY HORROR SHOW runs October 19 through October 27, playing Thursday at 7:00pm and Fridays and Saturdays at 8:00pm, with a special midnight showing on Saturday, October 27. Friday, October 19, is the traditional pay-what-you-can night of THE ROCKY HORROR SHOW. All tickets not pre-sold at the regular ticket price will go on sale at 7:30pm that evening for a $5 minimum donation. Tickets are $25 and may be reserved online via the below button, by phone at (931) 645-7699, or at the theatre during regular box office hours (9:00am to 2:00pm, Monday through Friday, and one hour prior to curtain). Military, APSU students and CitySaver coupon holders can receive two tickets for the price of one to Thursday’s performance.